To the majority, fast food chains are synonymous with poorly sourced, mass-produced and generally tasteless food. To the rest, these fast food chains represent their secret shame of hiding behind dark glasses while placing their orders in a drive-thru. A household expenditure survey by the Australian Bureau of Statistics revealed that Australian’s expenditure on fast food and eating out has grown by 50 per cent, with Australian’s spending nearly a third of their weekly household food budget on dining out and fast foods. It is no wonder that in 2011, Australia, labelled as one of the ‘chubby’ countries, is the 11th biggest-spending fast food nation on earth. We now have more that 1250 Subways, 845 Domino’s, 780 McDonald’s, 300 Hungry Jacks and 600 KFCs. Catering for the diverse taste of the public, fast food chains are evolving to include ‘gourmet/signature’ ranges in their repertoire, in addition to their tried and tested formulas. Domino’s has included ‘Chef’s Best’ range in their menu which includes chicken and camembert, and shiraz lamb and tomato; KFC is now boasting their switch to good, 100 per cent Australian canola oil while McCafeTM uses coffee beans sourced only from Rainforest Alliance CertifiedTM farms in Brazil, Colombia and Costa Rica. Some are even trying to gain market share using absurd claims – Nando’s campaign on their Peri flavoured sauce range, “Use Peri-cetamol for: Fast and effective relief from bland food with chicken, stir-fries, sandwiches, dips, tuna, salads. Basically anything that suffers from severe plain. Suitable for: people with an ache for flavour, chicken breastfeeding”; and who can forget the claim by fast food giant, McDonald’s – “You can’t be named Chicken without knowing a whole lot about chicken”, followed by “20 Chickens agree the McChamp is taste that’s worthy of its name”. It is hard to ignore the pervasive influence of fast food as so many food trends have arisen as the collision of American junk food and fast food ideas. 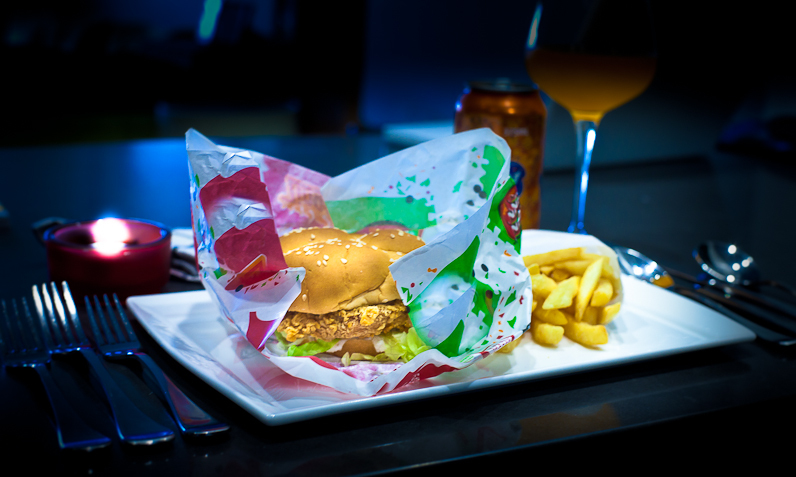 Chefs are incorporating fast food ideas in their menu by utilising quality ingredients. Culinary icon, Thomas Keller, who has a mortal weakness for cheeseburgers from a local fast food chain, serves his prime beef burger on a brioche bun in his restaurant, Bouchon. Gordon Ramsay serves his cheeseburger with smoked streaky bacon and triple cooked chips in Foxtrot Oscar. David Chang, in his book Momofuku, confessed that he ‘loves loves loves fried chicken’ and serves it in his noodle bar in New York. Closer to home, the fast food fever spreads with chef Warren Turnbull unveiling his new burger joint last month, Chur Burger; burger king, Justin North, opening his new restaurant, The Burger Shed; and Huxtaburger in Melbourne continues to draw the crowd in. There’s something to be said about the pleasure fast food elicits. Recently I ordered a burger from The Carrington in Surry Hills. It was a burger and it came with fries. Good times. You can chalk it down to convenience or time constraints but the essence of fast food is so entrenched in our culture that it goes beyond the convenient locations and long hours of operation. So whether at home, in a gastro pub or in the drive thru, give the guilt a well-earned break because fast food is here to stay.